You might be interested in celtic knotwork because you saw an illuminated page of a medieval Bible such as the Book of Kells, which can be found at the Trinity College in Dublin. You may like to try and do similar things such as this page I illuminated for an article I wrote in Pour la Science, the French version of Scientific American. Calligraphy by Chantale Fachinetti. Or you’d like to have a tatoo but unfortunately the guy down the street is not as talented as Pat Fish who does very nice things such as the image on the right. In Ireland you can stumble against stones which prove that these patterns are not only the last trendy stuff. But knots and links have been around for quite a while. And if Europeans call them Celtic, the people from India know them for longer (see ISKFA06) and the Islamic world boasts techniques much more elaborate than the Celts. Visit Craig Kaplan website for a wonderful java program on Islamic tiling and interlacing. In this tutorial, you are going to learn, in less than one hour, how to draw such designs. The technique is summarized in the following picture. A graph (in red) codes a knot, to construct it, you place little crossings on the middle of each edge. Then a simple maze-like procedure allows you to join these little bits of threads into continuous lines that you can smooth. After that, you draw the over/under pattern, using an easy guide. Finally you inflate your knot, like a road in which the previous threads are the yellow line on the middle of the road. And you’re done, it’s that easy! Please note that I am not concerned here with other celtic designs. You may find excellent books on these, for example the one wrote by the great artist Aidan Meehan. 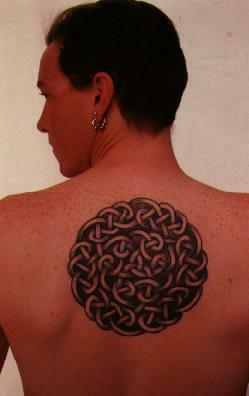 Cari Buziak treats this sort of things too, as well as mastering knotwork. In fact, it is so easy that a computer can do that, there are several implementations of my methods. The best ones are KnotPlot, KnotScape and the magnificent KnotsBag. 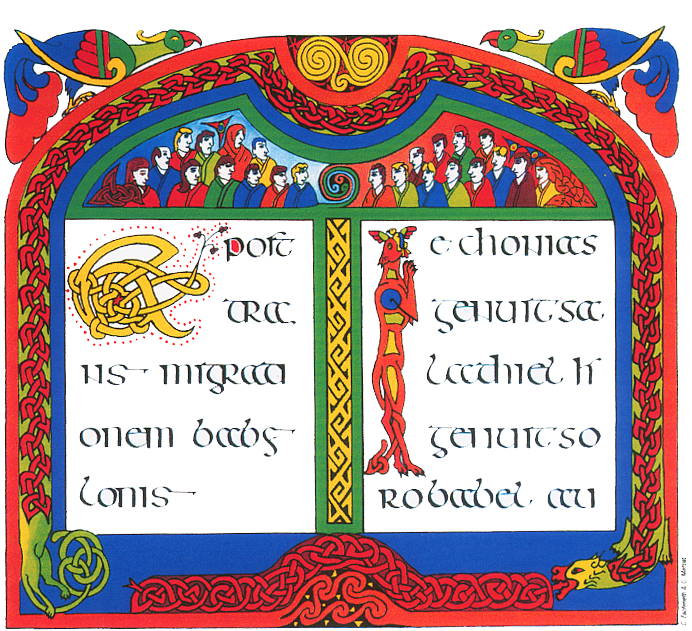 This tutorial stems from two series of courses in illumination techniques I gave in the calligraphy school of the Alcuin Institute at St Cyr sur Loire in 1994 and 1996. I thank Richard Forestier, Chantale Facchinetti and Agnès-Frédérique Forestier for having the grace and patience to welcome me. Without their care and interest in the subject and their passion for things well made, I would never have prepared this tutorial and it was thanks to them that I worked out ways to describe intelligibly the mathematical objects (very simple for a mathematician) that form the basis of the theory. I thank them here. The course really begins from the basics up. 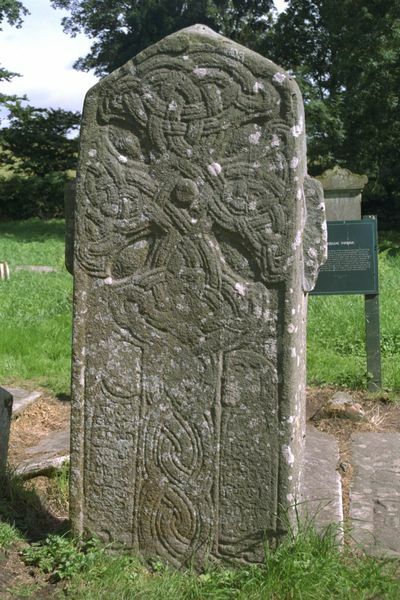 I am glad to contact with you as a researcher interested in Celtic knot and other traditional string cycle patterns. rotating symmetry, and the web image display the animation of that tracing. of the Journal with surface/air mail. Please give me your any comments or opinion about it. Thank you for this site! 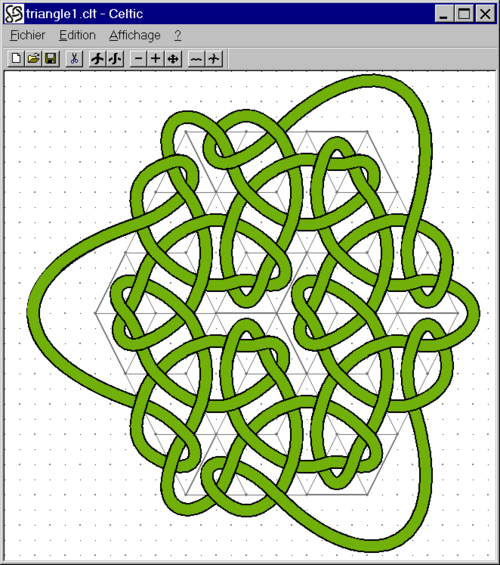 I am interested in learning the history / technique fo very simple celtic knots. I’m a real beginner!